ITPA is a volunteer organization created by and for the independent telecommunications industry. Dedicated to community service, ITPA has been serving the public on behalf of telecommunications companies since 1920. Find Club, Resource, and Membership information and forms all in PDF format and in one easily accessible place. Pay Dues We are pleased to announce that ITPA now accepts major credit cards! Eliminate the burden of mailing dues payments or donations with our new PayPal options. 2019 Assembly Mark your calendars and make your reservations for the ITPA Annual Assembly in Asheville, NC on April 12-14 at the Double Tree by Hilton Asheville- Biltmore. Click here for more info. ITPA is the volunteer organization created by and for the independent telecommunications industry. Dedicated to community service, ITPA has been serving the public on behalf of telecommunications companies since 1920. ITPA represents telecommunications employees and retirees nationwide. 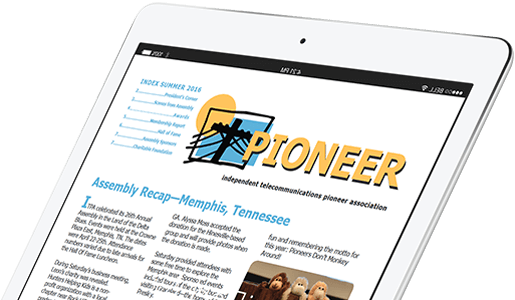 Today Pioneers continue to open exciting new lines of communication and community service throughout the United States. Once located in Washington, D.C., ITPA's National Office and Museum relocated in 2001 to the small, beautiful city of Hinesville in Liberty County, Georgia.